This skeleton of a dead (?) basement monster was found by a worker installing cable beneath a house, leaving the terrified resident to wonder what kind of goblin lair lies just beneath the floorboards. Is the creature a wild animal? A lost pet? Or is this something science cannot (or will not) explain? 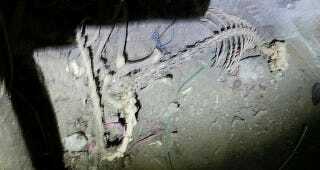 The resident posted images of this horrific skeleton after it was discovered by the cable installer. As seen in the original photograph below, the bricks or blocks of the foundation are visible, along with the earthen floor where the beast came to its end. As for the terrifying shadows, those appear to be created by the beams or basement rafters or the suffocating fear of the installer trying to hold his phone camera still before the skeleton gets up. "Cabler found this while doing under-floor cabling." a Reddit user known as jellymelly wrote. "WTF is it?" The advent of mobile phone cameras has resulted in a surge of photographs of such monsters—both alive and dead—from the legendary Montauk Monster to its disturbing kin often found on beaches around the world. Holy Crap, What Is This Horrifying Monster That Washed Up In San Diego? You're reading Kinja's front page, the showcase of the very best, must-see stories and discussions from Gawker Media blogs and the Kinja universe. Follow us on Twitter.